World 2-A is a special level in World 2 of New Super Mario Bros. 2. This level is an aerial, ruin-like level filled with Fuzzies that attempt to hinder Mario's progress. Completing this level unlocks World 2- , skipping World 2-3. Moving platforms which follow tracks make up most of the level which Mario must use to cross the large abyss. Platforms before the checkpoint fall into the abyss after riding on them while platforms after the checkpoint cross onto different tracks. The main power up here is the Super Leaf, which can be found in one of the first ? Blocks and ? Blocks after the checkpoint. A Coin Roulette Block can be found in the beginning of the level. Enemies found here include Koopa Troopas (some walk about on the moving platforms), Paratroopas which block the player's path when jumping from platform to platform and Fuzzies found in the second half of the level. 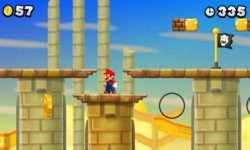 Star Coin 1: When Mario is on the third moving platform after the Coin Roulette Block, the player should look out for another platform above him and jump onto it. Continuing on normally will take Mario to the Star Coin. Star Coin 2: Just before the checkpoint. However, it is very difficult to get this Star Coin by normal means. The player can safely get this Star Coin by using the Red Koopa Troopa that is on one of the platforms; the player should jump on the Red Koopa Troopa, and then throw its shell at the Star Coin. Star Coin 3: After the checkpoint, the player must ride the first platform up. At the platform's highest point, there is another platform. Mario should ride this platform to an area with a ? Block and a Brick Block. The Brick Block contains a P Switch. The player must hit the P Switch, then follow the Blue Coins. They lead them to the final Star Coin.